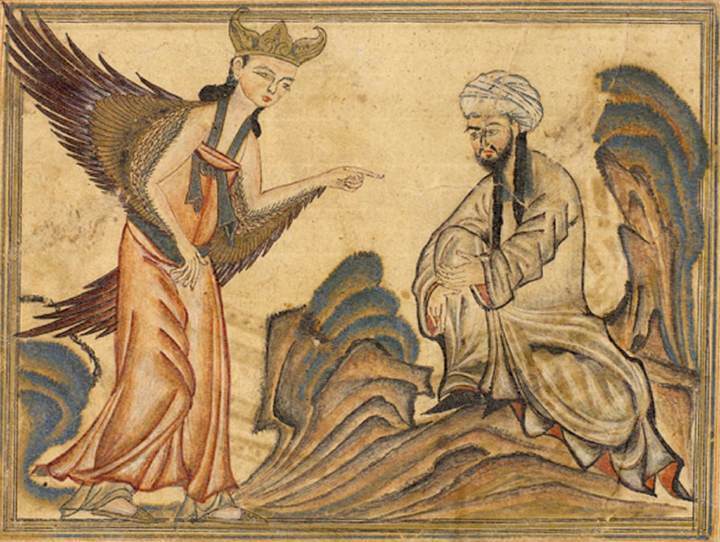 It is claimed that Mohammed was illiterate and the Koran, was literally the word of God, transcribed by others (like Socrates) from his revelations. Mohammed is therefore a prophet and teacher but in reality a mouthpiece for the absolute message of God. Books, especially the Koran, are held in the highest regard and mosques functioned as repositories of books. In Sura 75:15–18 attentive reading is specifically mentioned. This reverence for the ‘book’, especially the Koran, is paramount. Indeed it was almost immediately made into a ‘codex’ (book form), as they had acquired paper technology from captured Chinese sailors in 751AD. One had to even wash before touching the Koran. The dominant role this one book, of similar length to the Gospels, has had on education in the Muslim world cannot be underestimated. For five centuries after its emergence in the 7th century, the so called ‘Golden Age of Arabic culture, encouraged centres of learning in Damascus, Bagdad and Cairo. Their libraries collected and distributed Western classical texts and made advances in mathematics, science, philosophy and law. Koran means ‘to recite’ and the text was originally meant to be read aloud. It has been argued that this has led to a dependence on rote learning. Prayer is one of the five pillars of Islam, recommended five times a day, so the repetition of recitation, known to be effective for embedding knowledge in long term memory, becomes an ingrained habit, as does listening attentively, especially at Friday prayers and also through the attentive reading of the Koran. On the other hand this focus on recitation and repetition tends to infect studies across all subjects and education in the Arab world has been criticised for its dependence on simple recitation at the expense of critical analysis. Islam literally means ‘submission’ and it has been argued that this affects the way learners and teachers approach education. In particular, memorisation of the Koran, which has been admired for centuries in the Muslim world, may have encouraged the memorisation and regurgitation of text, rather than analysis and critical thinking. With traditional paternalism, authority of the state and dominance of religion, some argue, comes a lack of questioning, passive learners and didactic teaching. Obedience and compliance, not unusual in other educational systems, are arguably much more embedded in Islamic countries. The time spent on religious studies also squeezes out time available for other subjects. This may be another reason for the low levels of original research and patents in countries where Islamic education is dominant. Writing, not only through the Koran, but in other expository texts, is a strong feature of Islamic education. Sura 96 urges believers to ‘recite’ but also explains that God taught man through the ‘pen’, namely writing. Writing, especially calligraphy, is regarded as a high art form, as it is in the East (but never was in in the West). The double edged sword is that the power of the pen is seen as the power of God’s absolute religious knowledge, not the freedom to write critically. Indeed, the writing, even drawing, has led to death threats ‘fatwas’, on novelists and cartoonists. Islam, like Christianity, has supported the extremes of rigorous scholarship and education but also bans on education (especially for women) and even the burning of books. The Arab world has one written language, and, as the Arab Spring has proven, its demographically young populations have used technology to depose dictators and criticise the cronyism, nepotism and corruption in those societies. With this may come a more open attitude and access to education, using the technology they so successfully used in learning how to change their systems of government. We should start to see the emergence of good Arabic content, tools that cater for the Arabic language and an increased use of technology based learning, along with the democratisation of education. For all its educational qualities, the focus on one book, its absolute truth and primitive recitation, repletion and memorisation seem like primitive pedagogies, leaving little room for active and critical thought. Islam, like the extremes of Christianity and Judaism, can be seen as a return to an absolute form of dogmatism, where young minds are locked down before they have had a chance to reflect or choose. This is an anathema to secularists who believe that education should open young minds not close them down. On the other hand, let us not forget that the Islamic world encouraged learning, scholarship and intellectual endeavour, gifting the world those texts of the Classical world we now so admire.